Jason Loeffler was born in Springfield, Missouri (read: "mis-er-y"), in the spring of 1987. Growing up, he spent hours flirting with Oscar Wilde, utilizing his gray cells next to Hercule Poirot, and bellowing King Lear in the shower at the top of his lungs. Conrad Swibel, 'Working' (2005); directed by Dr. Robin Schraft. Continuing his theatrical studies, Jason spent two weeks touring Broadway, and several months in London's West End, taking courses in contemporary theater, in voice, and in writing for the stage/screen. 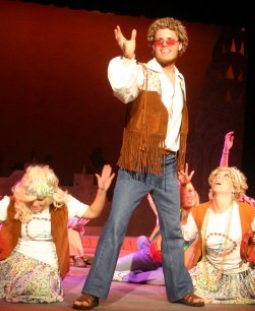 These endeavors culminated in an award for the Best Performance by an Actor in a Supporting Role, for Jason's portrayal of Big-Daddy Bruebeck in Neil Simon's "Sweet Charity." He also received a university degree with honors, both in writing and in English. 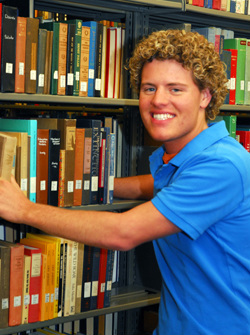 After graduation, Jason began work on his first novel. In it, he combined Shakespeare's The Merchant of Venice with a cunning mystery, and set it on the streets of Chicago. The result? One young man's struggle to prove his worth, The Devil's Purpose, for which Jason is now seeking representation. The novel's sequel, A Sparrow's Fall, which puts a different spin on Shakespeare's Hamlet, is also currently in production -- and seeking representation. It is set to be finished sometime next year. Prince John, 'Henry IV, parts I and II' (2006); directed by Dr. Ruth Monroe. 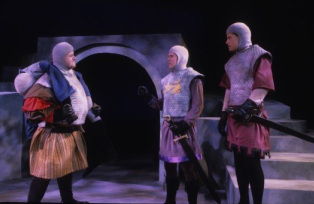 Stephen Ehrlich as Prince Hal (center) and Jim Anderson as Falstaff (left). 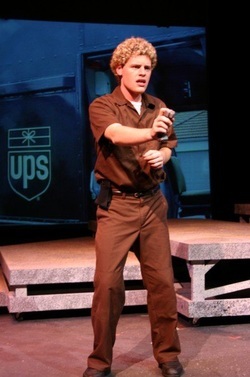 Big-Daddy Bruebeck, 'Sweet Charity' (2007); directed by Robert Westenberg. Never one to sit still, Jason continues to market his short stories, which are available for purchase online. He also remains active in his local theater scene and attends several regional writer's workshops each year, no matter where his errant heart decides to take him. Currently, he lives in Chicago, Illinois. If you would like to contact Jason, he can be reached at the email listed on the Contact Info page, and for monthly updates on publications and appearances, please join his mailing list. Feel free to friend him, follow him, or become a fan online as well - he checks his social networks regularly and updates their content as often as possible. Cheers! 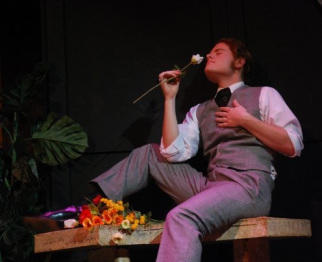 Duke Orsino, 'Twelfth Night' (2008); directed by Robert Westenberg.